I have decided to dedicate my body to an experiment for the following 30 days. And originally, I didn’t know if I would disclose this information on my blog or not, but I have decided that I need to since it will be drastically altering my diet and consequently my altering blog! I figured that I might as well be open and honest with my readers, and maybe even some of you can benefit from the findings and will want try it too. I’ll be the guinea pig though, because it is a pretty ridiculous theory that even I’m skeptical about. So what is the experiment, you ask? For one month, I will not eat sugar, fruit, dairy, or carbohydrates for six days out of the week, followed by a 7th day of binge eating whatever I want until I go into a coma (told you it was ridiculous!). I didn’t make it up though. It is called the slow-carb diet and it comes from the book titled The 4 Hour Body, which is currently a best seller and causing quite a stir in the fitness/weight loss/health world. And how could it not? It goes against everything that every other diet tells you to do. It contradicts everything that I thought was healthy, but rather than be a naysayer that dismisses it as sheer ludicrous, I figured that I would give it a shot and put it to the test! But before I go on, let me put you all at ease. I’m not trying to lose weight. No, I don’t want be the 80-pound girl with the eating habits of a 400-pound man! Rather, I am trying to lower my percent body fat and build lean muscle. You know, erase the evidence of all the French fries from my hips and thighs and build toned arms. However, the average person that engages in this diet sees a 20-pound body reshaping, between weight loss and total inches lost, in just….drumroll, please….1 month! For me, this will also be a major test of self-control…probably one of the hardest things I have ever attempted, actually. I can resist the temptation of a lot of things, but I never deny myself food. I eat what I want, when I want. But this will force me to change and think about what I am putting into my body, which will be good for me…and my body! In addition to the diet, I am also following a fairly rigorous work out schedule because again, my goal is to put on lean muscle. The book claims that you only need 4 hours of solid work out per week (hence the title of the book), but I will probably be engaging in a bit more than that. I will use the blog as my food journal to record how I feel, what I eat, and my progress. Since I will be on such a strict diet, I will probably be eating in more and posting more recipes than usual, but watch out on binge day!!! I will probably have 5 or 6 posts on those nights, as I plan to eat my way fit! Ohh, and if you’re wondering what the purpose of the binge day is, it is used to increase your metabolism and of course satisfy all the cravings you have developed over the week! So….let the journey begin! 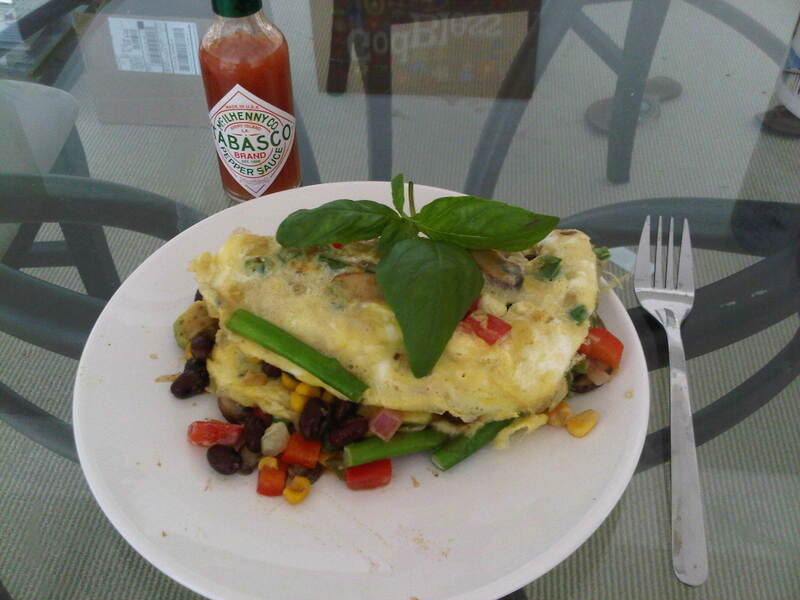 Today I started my morning with a delicious 3 egg omelet with sautéed spinach, mushrooms, onions, jalepenos, asparagus, and red bell pepper. I used the whole egg because egg whites don’t really appeal to me, and this is allowed in the diet as long as they are organic eggs. I’ve never had organic eggs, or brown eggs for that matter (apparently all organic eggs are brown eggs), but they tasted the same as white ones….just cost me twice as much. The secret to a perfect omelet is fluffy eggs. Normally, I add a drizzle of milk when I scramble the eggs, but since I am on this diet and restricted from dairy, I used a little bit of cream of tartar instead. You only need a little pinch (very little!!! ), which makes the eggs super fluffy. The hardest part about making this omelet today was not putting in any cheese, which is my favorite part!! The thought of no ooey gooey cheese had me in a depression, but surprisingly I didn’t really notice the difference!! I was amazed. I think my associating cheese with eggs had just become habit. I couldn’t imagine one without the other, but I was pretty okay with it today. Of course, I used a ton of Tabasco sauce…but there is nothing against hot sauce in my diet….so spice on.